Homeschool is such an important part of our society today. Some of us don’t have access to quality public education, and quality private education is too far out of the reach of the average household. I attended homeschool myself for a period of time growing up. Parents of homeschooled children need support as their children progress through their school material. Modern technology allows us to play, pause, and rewatch recorded educational instruction in the comfort of our home – something I didn’t have as a child during my homeschooling years. I’ve been working with Compass Classroom for over a year now, promoting their various discounts and promotions of their homeschooling products. 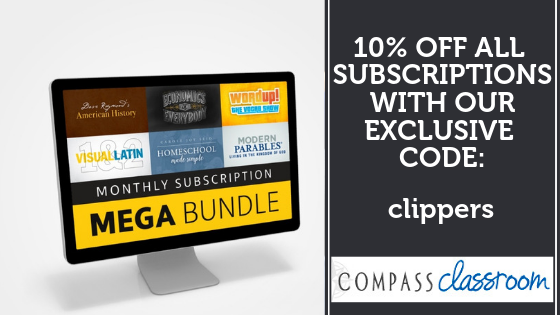 They recently offered Christian Clippers subscribers 10% off all subscriptions for the life of the subscription – which means you receive 10% off today, and 10% off each month that you maintain the subscription. If you’ve been looking for teaching aids for your homeschooling setup, check out Compass Classroom, your Christian approach to supplemental homeschool video material.